The title of David Adams’s book A Handbook of Diction for Singers, discussed in yesterday’s blog, is followed by a subtitle “…Italian, German, French. 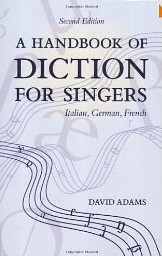 By “diction” Adams does not mean what literary types mean, namely choice of words, choice of means of expression — he means pronunciation and clear articulation, and in particular how to infer the pronunciation of Italian, German and French words and phrases from their spelling. I know of no other work in English that offers such a comprehensive, and as far as I can tell accurate, account of these spelling-to-sound relationships. • In pietà [pjeˈta] and fiore [ˈfjoːɾe] we have the glide /j/. To pronounce it as the vowel /i/ “is a common error that must be corrected”. • Furthermore, when the vowel-letter i follows c or g it is important to recognize whether it “has a vowel function” or whether it is silent, serving only to soften the c or g.
• Italian u is never “silent as in French”. • Adjacent vowels separate into different syllables under various (specified) circumstances. Conversely, when they come together across word boundaries they form “phrasal diphthongs” or “triphthongs”. • The letter h is always silent. After c and g it indicates “the hard sounds of those consonant-letters”. • The combination gn “results in” the sound /ɲ/, and -gli- in /ʎ/ (doubled unless initial). And there’s everything you would expect about doubled consonants, including those resulting from raddoppiamento sintattico. It’s all tied in with extracts from musical settings by classical composers. Note the syllabification here in my all-time favourite aria: sia il makes a single syllable. There are fifteen pages devoted to the musical treatment of vowel sequences, diphthongs and triphthongs, in words and in phrases. Another fifteen are devoted to Guidelines for Determining Open and Closed [sic] e and o in the Stressed Syllable. Just what the classical singer wants. Still to come: Adams’s treatment of German and French. Is Italian 〈r〉 an /r/ or an /ɾ/? Just the other day I had a friend tell me how she feels that even the Italian /j/ seems geminated to her and that sometimes she wonders whether one could, for example, state it's correct to say /ˈsɔɲʔo/ instead of /ˈsɔɲːo/. Hm. Compared to English, how would one categorize /tʃ/ /dʒ/ in terms of whether they're apical or laminal or perhaps more or less palatalized? Single /r/ in Italian is usually a tap [ɾ], double usually a trill, which Adams writes [rr]. A glottal stop in sogno would be truly bizarre. Confusion between /j/ and /ʎʎ/ (and /lj/, as well as between /nj/ and /ɲɲ/) (whatever their articulation) is not uncommon in colloquial central/southern Italian. The book is about (classical) singing, not speech. It would interest me if Adams has something to say on the difference between the English and the Italian 't', 'd' respectively. ah yes, I forgot: the alveolarity shows forth (if this be the word for it) in (classical)singing too; couple of days ago I heard on the radio I believe King's Singers with something German or maybe Italian, I now forget which. It was great---musically and all but perfect pronunciation-wise, as far as I could judge. Yet---unmistakeably English: their 't's and 'ds's. In the US, dental /t/ is associated with a New York accent - it might be substrate influence from Italian and Yiddish (and, more recently, Spanish). I seem to have had to impression (during my US years) that the 'd' in 'da', 'dey', 'dem' and so on (substandard forms of 'the', 'they', 'them') is dental rather that alveolar. Is that right? Anyone to (dis)confirm that (dat)? In England it's 'va','vem','vey', innit, so the problem doesn't arise. Re Italian pronunciation by Anglo-, Germano- or Scandinavophones, there is the problem of the aspiration of voiceless stops. In Italian it's 'pane', not 'p*h*ane', 'togliere', not 't*h*ogliere', 'cantare', not 'c*h*antare'. I wonder if John's book (by Adams) mentions this problem. Mutatis mutandis, the same goes for French, Russian, Spanish (talking about 'musical' languages only). I think this issue is possibly more important that that of the alveolar/dental quality of 'd' and 't'. Wojciech: Yes, of course Adams mentions (non-)aspiration of plosives. It's one of the most obvious differences between Italian/French p t k and English. Wojciech: Not as dental as in Hiberno-English, but American English in general may be characterized, Italian-style, as a lingua irlandese in bocca tedesca. I don't necessarily agree with the ones that appear under my own name, never mind the rest. They are primarily there because they have enough truth to seem funny to me. And the phrase is all the sweeter to me as an AmE-speaker of Irish and German origin. @Wojciech: Actually, word-initial /D/ is an exception to the interdental-to-labiodental rule in southeastern England, thus "da, dey, dem" - I don't think any dialect of English uses /v/ in those words. @John Cowan: It's funny how eastern New England, the part of the US with the greatest proportion of Irish ancestry, has the most "English" sort of dialect - non-rhotic and LOT-PALM distinguishing, with the remnants of a TRAP-BATH split. It seems a very good book. I'm looking forward to reading it. well, John has banned this topic from his blog, but ... praeterea censeo nullam adesse vocalium quantitatem sermone italico [kjakkjeˈɾaɾe] etc, sine ':'. I have my good reasons to be so stubborn. It has looked to me for the past 50-odd years as if the practice of writing close vowels with the acute is virtually extinct in Italian. I suspect the Italian attitude is that the grave looks better and requires no cerebration. Quibbling about this usage is a bit like expecting Modern Greek to distinguish between the polytonic accents. Note the syllabification here in my all-time favourite aria: sia il makes a single syllable. As there are two other vocal lines below the one quoted, one of which I am at present singing in a production of this opera in Connecticut, I can't forbear to point out that Soave sia il vento is a trio (or "terzettino," according to the score), not an aria! While "io" is monosyllabic, and the final "e" of "felice" forms a single syllable with the following "u" of "un," the word "mio" is set as a disyllable, and even as a quasi-rhyme with "sospiro." (I can't think of any parallel to this in his libretti: a disyllabic quasi-rhyme based on repetition of vowels alone, despite a difference of consonants, let alone with one verse separating the vowels with a consonant and the other not.) Mozart's setting makes the disyllable all the more emphatic by setting the word on two notes with a drop of an octave between them. …not to mention the infamous "di mia infelicità" of this aria, where the successive i a i are set to a long top D, then B. There are as many versions of this vowel distribution as there are baritones who sing it. You are right about that one! I myself am rather insistent (some might say obsessive or pedantic) about observing poetic prosody, and accordingly use all of the long D for the "i," then fit the "ai" into the very short B that follows it in the downward arpeggio, but I think most singers spend only the first beat of the D on "i," go to the "a" for the rest of it (probably because they prefer that vowel at that pitch), then put the following "i" on the B on the way down. What is least successful is when the i and a are very rhythmically divided as dotted-quarter and eighth on D, with the next i sung as a D-B melisma on two eighths.